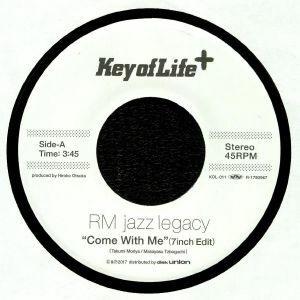 RM JAZZ LEGACY Come With Me vinyl at Juno Records. This tasty seven-inch single offers up two previously unheard reworks of tracks from RM Jazz Legacy's acclaimed 2016 debut album. Side A sports an on-point seven-inch edit of "Come With Me", which is the kind of low-down, Blaxploitation era style jazz-funk workout that could previously have emerged from the studio of Roy Ayers. Turn to the flipside for an "Alternate Version" of the deeper, looser and woozier "Let's Stay Together", an altogether fresher and breezier concoction that sees the Japanese producer and his accompanying musicians trade guitar, electric piano and horn solos over a lolloping groove. The sound of summer.